Peter Insull at Peter Insull's Yacht Marketing drops me a line to say that he's signed a joint central agency with Tomaso Polli of Edmiston & Company for the sale of the 58.7m motor yacht Bleu de Nimes. Peter goes on to say that he personally found this superyacht when she was being 'disposed of' by the UK Ministry of Defence and the owner is one of the most experienced yacht owners he knows, overseeing every detail of her conversion into an explorer yacht in 2006. Bleu de Nimes was built by England's Clelands yard in 1980 and has two large decks within her hull giving vast spaces for owner and guests. Her interior, designed by Pier Vittorio Cerruti, accommodates as many as 21 guests in nine staterooms and she cruises at 12 knots. She has already cruised extensively and recently completed a Pacific cruise. 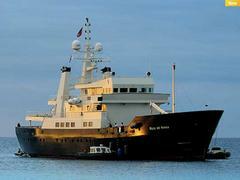 Bleu de Nimes is asking €29 million.